Love ConnectWise, but hate their reports? Who are your best customers? Your worst? Which clients are you MAKING money on? (including the cost of your staff) Where are you LOSING money? Total Profitability gives you a stack-ranking of your clients from best-to-worst. Click any column header to re-sort from worst-to-best. Not sure if you’ve found a ‘business problem’ or maybe just a ‘ConnectWise data’ problem? 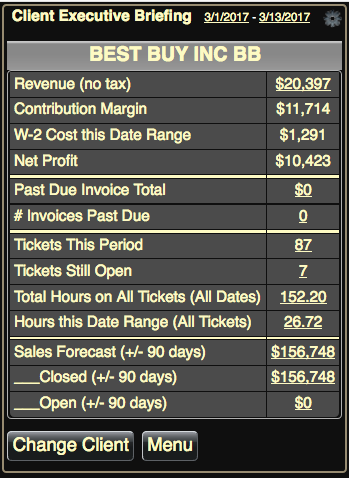 Drill-down all the way to the invoice and time entry line-item detail in just a few clicks to see all the underlying details. 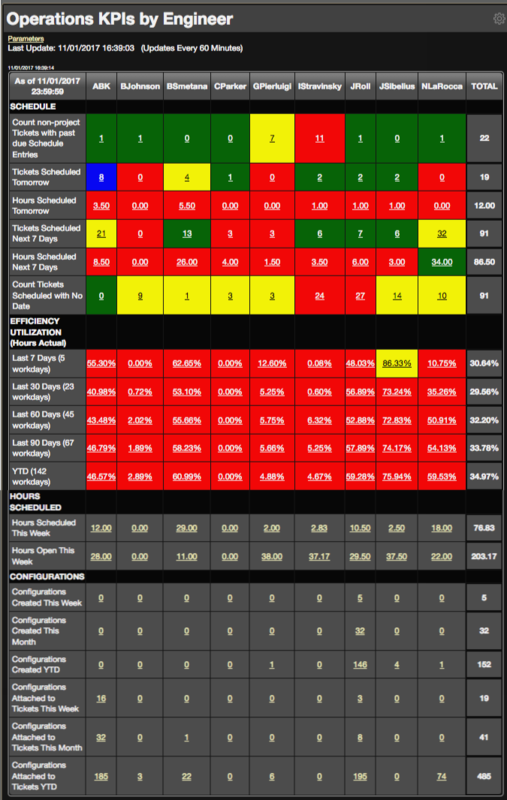 Analyze your business by selecting any combination of up to 10 ‘Lines of Business’ and 30 metrics. WHO IS YOUR BEST ENGINEER? Who is your best engineer? Well, you can measure that a lot of different ways, but one way is to see which engineer is MOST PROFITABLE for you, taking into account the work that he/she is doing as well as what you are paying them. 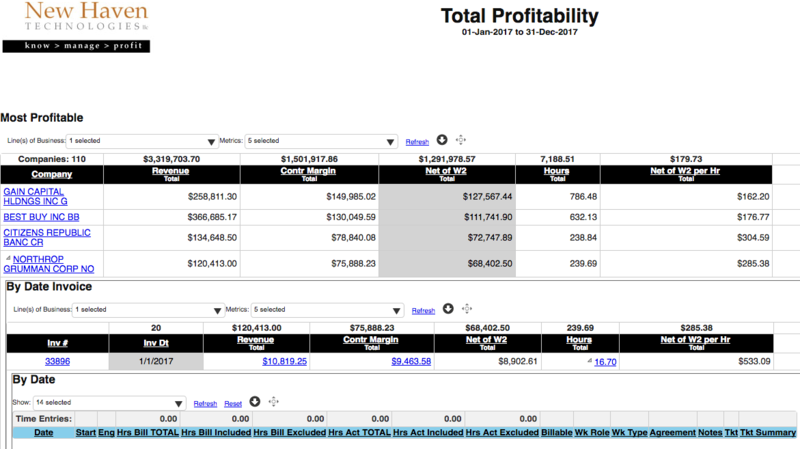 The ‘shaded’ Net Profit column (see below) shows you which engineer is most profitable for you based on the work they are doing and what you are paying them. ARE YOU SUCCESSFUL WITH RECURRING REVENUE? Monthly Recurring Revenue (MRR). It is what we focus on and a key driver to our overall success. But those “flat fee” contracts can be hard to evaluate, especially because your #1 factor between success and failure is how many hours your engineers spend on each client. It’s also a tempting place for an engineer to log some time so that they get their 40 hours per week reported, and it’s tempting because the customer is not getting an additional bill for the hours, so it’s unlikely that anyone will question the time. Hey! Get your time in! HOW’S YOUR SCHEDULE? TICKETS? UPDATING CONFIGURATIONS? Being an engineer is no easy task. You need to manage your schedule. Plan your work. Work your plan. Keep up on assigned tickets. It’s easy to get distracted. Give them a gentle reminder of where you’d like them to focus. You can pick-and-choose what Dashboard panels you use, and you can drag-and-drop them in any arrangement that you want to fit the screen that you have mounted on the wall. And remember, if we do NOT have a Dashboard that fits your needs, CUSTOM DEVELOPMENT is included in your monthly subscription at no additional charge (and that applies to reports, dashboards and smartphone reports). So you don’t have to ‘make due’ with an ‘off-the-shelf’ option. We can bring the great idea that you have to life! You’re sitting the lobby of the customer, getting ready to meet with the owner. It’s been a busy week so you haven’t had the time to prepare for the discussion as much as you’d like. But it’s important that you know about the status of the relationship with this client, and it’s ALSO important that the client ‘knows that you know’ so that you show you value the relationship. Client Executive Briefing shows you a synopsis of the relationship on one screen on your phone. Subscription is month-to-month with no long term commitment.